With 2016’s Star Trek Beyond, we get a continuation of the franchise’s reboot that started in 2009 and continued with 2013’s Into Darkness. As we enter Beyond, we find the inhabitants of the Enterprise well into their “five-year mission” to explore new civilizations. These experiences leave Captain James Kirk (Chris Pine) at an emotional crossroads, as he starts to lose interest in the “lather, rinse, repeat” nature of these explorations. As such, Kirk applies for a promotion to Vice Admiral and a position as commanding officer of the Starbase Yorktown. While Kirk and crew take shore leave at the Yorktown, they get an assignment to go on a rescue mission. Instead, they find themselves trapped in an ambush, as a mysterious figure named Krall (Idris Elba) leads an attack on the Enterprise. With their ship torn to shreds, Kirk and company crash-land on the planet Altamid. There they attempt to survive and also deal with the menace caused by Krall. 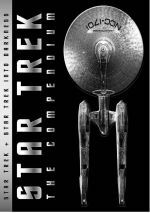 While I liked both of the first two Trek reboot films, I thought they presented diminishing returns. Whereas the 2009 flick offered an exciting breath of fresh air, Into Darkness felt more derivative and less engaging – I enjoyed it but it offered a mild disappointment when compared with the 2009 film. Going into Beyond, I admit I assumed the franchise’s third offering would give us an even less satisfying tale. This came from a shift in talent behind the camera. JJ Abrams directed the first two movies, but he passed on Beyond so he could make Star Wars: The Force Awakens. This meant a new director for Beyond, and the producers tapped Justin Lin to do the job. This didn’t inspire a ton of confidence in me. Lin earned his main claim to fame due to his involvement in four of the Fast and the Furious flicks: he directed the franchise’s third through sixth chapters. Though those films made a ton of money, I never took much enjoyment from them. I find the Fast and Furious films to provide fairly generic action thrills. It didn’t bode well for Beyond that 2015’s Furious 7 - the first flick without Lin in more than a decade – was probably the best of the series. Still, I didn’t want to prejudge Beyond, so I hoped that Lin would keep it more Trek than Fast and Furious. Did Lin succeed in that regard? Not really – while Beyond comes with the basics we associate with Trek, it lacks the heart and personality that mark the franchise at its best. I don’t think I’d call the movie Fast and Furious in Space, but I do feel that Lin emphasizes action to the exclusion of much else. Not that Beyond offers one thrill after another – it does attempt character moments and introspection – but it fails to pull off the more sedate moments. Our characters feel stuck in stasis. When the franchise rebooted, Trek offered a glimpse at Kirk, Spock, McCoy and the others that fit with our existing conceptions but that managed to feel like they existed within their own universe. This meant we got personalities who echoed the Original Series versions but not ones who slavishly imitated them. I still don’t think the characters in Beyond duplicate their predecessors, but they don’t show a lot of growth since the first film. It’s like the 2009 flick spelled out who these “new versions” were and those behind the movie felt their work was done. Beyond pays lip service to additional developments but fails to make these elements stick. It doesn’t help that much about Beyond feels generic. The movie offers the rudiments of a Trek adventure but lacks a lot to create real intrigue. That goes from top to bottom. Krall offers a one-dimensional, semi-anonymous villain, and the movie fails to use the talented Elba to his best advantage. The movie’s plot also lacks much to stimulate the viewer. Beyond comes with a less than coherent narrative that never develops past “angry dude seeks revenge”. I think the cart leads the horse, as I get the impression the filmmakers came up with the various action scenes and built a story around these. I do think the movie offers good thrills, as those battles work pretty well. Whatever flaws he displays as a director, Lin knows his way around bombast, so the various action beats give the film kick. I could live without yet another scene that destroys the Enterprise, but the flick still delivers the requisite excitement. I just wish Beyond fared better when it indulged in its quieter moments. This never turns into a bad movie, and it clearly works better than the weakest Trek films. Nonetheless, Beyond lacks much personality and it gives us mediocre Trek. 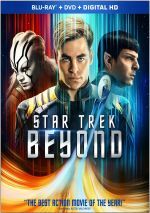 Star Trek Beyond appears in an aspect ratio of approximately 2.40:1 on this Blu-ray Disc. As expected, the image looked strong. Delineation seemed very good. The movie always came across as tight and concise, with little to no softness on display. I noticed no shimmering or jaggies, and both edge haloes and print flaws failed to materialize. Beyond went with a heavily teal palette. Other hues appeared, but a strong blue orientation dominated, and the disc reproduced the tones well. Blacks appeared dark and dense, while low-light shots presented good clarity. Everything about the transfer impressed. Yup. In particular, the movie’s space sequences created a great sense of depth and movement, as these elements zipped out of the screen in an impressive manner. Other shots tended to focus more on general dimensionality, and those also contributed a nice impression. Picture quality also worked well. Colors and sharpness remained on a par with those found in the 2D version, whereas shadows took a minor – and inevitable – hit. Overall, I preferred the 3D version, as I felt the added impact of the 3D imagery made it a fun ride. As we shift to extras, two Deleted Scenes appear. We find “Kirk and Scotty in the Terminal” (0:44) and “Scotty Gets a Bib and Tucker” (0:17). As one can surmise from those brief running times, neither sequence adds much. Both give us minor comedic beats and nothing more. A Gag Reel lasts five minutes, 13 seconds. It presents a fairly standard collection of mistakes and silliness. A few funny improv moments appear but otherwise this seems like an average compilation. Nine featurettes follow. Beyond the Darkness runs 10 minutes, eight seconds and includes notes from director Justin Lin, producer JJ Abrams, co-writer Doug Jung, actor/co-writer Simon Pegg, and producer Lindsey Weber. “Darkness” looks at how Lin came to the franchise as well as aspects of the script/story and character developments. The show offers a decent overview and intro to the project. A major action sequence becomes the focus of Enterprise Takedown. This segment lasts four minutes, 31 seconds and involves Jung, Abrams, Weber, Lin, Pegg, editors Dylan Highsmith and Greg D’Auria, and actors Chris Pine, Lydia Wilson, Idris Elba, Karl Urban, and John Cho. The clip examines the destruction of the Enterprise and related elements. It gives us a short and moderately interesting synopsis. With the eight-minute, 17-second Divided and Conquered, we hear from Pegg, Lin, Jung, Urban, D’Auria, Pine, Abrams, Cho, editor Steven Sprung, and actors Sofia Boutella, Anton Yelchin, Zoe Saldana and Zachary Quinto. “Divided” discusses character dynamics in the film. It becomes another general but useful piece. Next comes A Warped Sense of Revenge. It fills five minutes, 15 seconds with info from Pegg, Lin, Elba, Jung, Wilson and actor Joe Taslim. “Revenge” offers another character-based reel, with an emphasis on the movie’s antagonists. While it adds to the collection, it seems fairly average. During the three-minute, six-second Trekking in the Desert, we discover material with Lin, Weber, Quinto, Pine, Cho, Elba, Urban, executive producer Jeffrey Chernov, political consultant Richard Klein, DP Steven F. Windom, and production designer Thomas Sanders. “Desert” looks at the movie’s locations. A few facts result, but too much of the program feels like an advertisement for Dubai. Explore Strange New Worlds takes up six minutes, two seconds and features Sanders, Lin, Quinto, Urban, Cho, Pegg, Yelchin, Wilson, Pine, Boutella, supervising art director Don Macaulay, and assistant art director Aja Kai Rowley. “Worlds” takes on set and production design. Like its siblings, “Worlds” seems fluffy, but it gives us some good notes. After this we get New Life, New Civilizations. In this eight-minute, four-second reel, we hear from Lin, Urban, Pegg, Chernov, Elba, Jung, Boutella, Quinto, Taslim, Wilson, actor Deep Roy, and SFX makeup designer Joel Harlow. “Life” views the movie’s alien characters and effects used to create them. It offers one of the better featurettes, even with the usual happy talk. To Live Long and Prosper goes for seven minutes, 51 seconds and boasts info from Pegg, Abrams, Lin, Quinto, Jung, Saldana, Pine, Cho, Urban, and Yelchin. “Prosper” offers a general appreciation for the Original Series and its movie legacy. Pleasant but insubstantial, it gives us little concrete information. Finally, For Leonard and Anton runs five minutes, four seconds. It features Urban, Abrams, Lin, Cho, Quinto, Pegg, and Yelchin. It pays tribute to Yelchin and Leonard Nimoy, two Trek actors who passed away recently. The show does its job. A third disc provides a DVD copy of Beyond. It lacks any of the Blu-ray’s extras. As much as I enjoy the Star Trek franchise, I can’t find a ton about Beyond to make it special. While the movie comes with some good action scenes, it lacks a strong story and it fails to move its characters along in a satisfying manner. The Blu-ray boasts excellent picture and audio but supplements seem average. 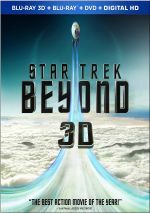 Though not a bad film, Beyond winds up as lackluster Trek.